This entry was posted in Birthday Cake. Bookmark the permalink. This is so cute! Love your layout and how you used all the colors together! Adorable! I agree, what a cute card. Everything goes together perfect. Thanks for the inspiration!!!! This is so fun, Amy! You are going to make me have to have that cake stamp! Love this birthday card Amy! 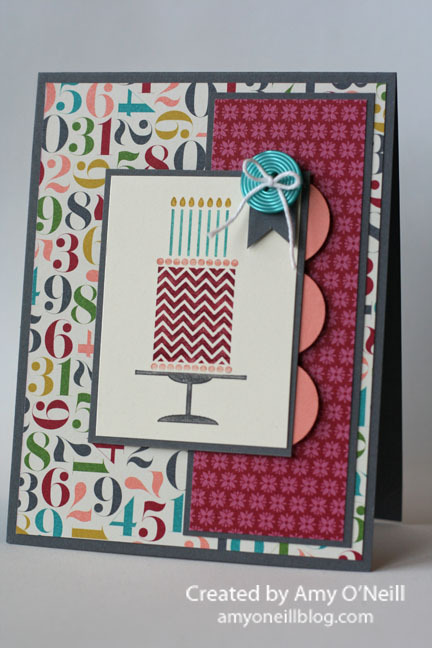 Might have to case a version of this – great use of the birthday DSPs. Great inspiration.